While I’m not familiar with Bem’s work, I do find it somewhat telling that despite the acknowledgement of stereotyping, this test proceeds to do just that. As I went through the questions, it became quite clear to me that I was going to be labeled as “masculine” — not because these traits are inherently masculine, but rather because that is what we have come to take for granted as a masculine traits (e.g., assertive, dominant, ambitious, to name but a few listed in the test) — as opposed to “feminine” (e.g., polite, mild, soothing). Of course, it is worth noting that there are only two gender identifications with which one can identify. 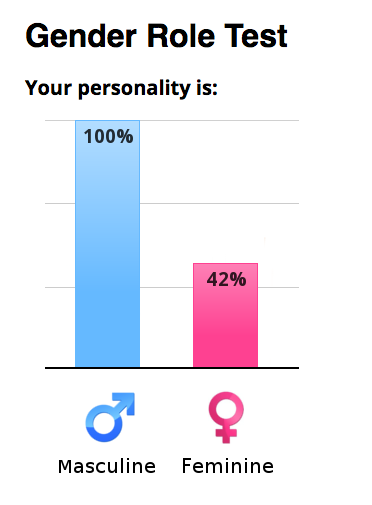 And while one can easily push back and say that these traits are gender fluid, etc., etc., what I find most compelling is the way in which these quiz questions reify gender norms broadly speaking. I suspect most people might nod and agree with their results, unless of course, they get something as drastically “different” as mine. Going through this test, I was reminded of an activity that Prof. Merinda Simmons had our undergraduate Gender Theory seminar do at the start of the semester. She drew two stick figures on the board (of course, this was a way for her to open a discussion regarding gender binaries later on) and told our class to “gender the stick figure.” Naturally, we began drawing skirts, pants, heeled shoes, and so on. At the end, Prof. Simmons then asked us to explain why the woman had a skirt and heels and the man had pants and a cap. The exercise worked well to get us thinking about the ways in which we may (unintentionally, perhaps?) reinforce gender stereotypes. This quiz does much the same thing. Whether one regards it as an accurate representation of oneself (after all, such quizzes use vagueness to their advantage) is, I think, to miss the point. When I shared my results in the comment section of my friend’s facebook post of her own quiz results, someone I don’t know complimented me on my defying the norms, as it were. She suggested that it made me even more likable. What I found so compelling in that short response was the assumption that I was breaking the barriers of gender stereotypes and asserting (there’s that masculine trait again…) my personality in the way I saw fit. While I appreciated the kindness of the comment, I had done no such thing. I was not attempting to break the mold in anyway, but because I didn’t fit to the stereotype, then I must be attempting to subvert it. In that moment, I was the subject of a similar stereotyping, where I had put forth no agency, much less a comment. That is all to say that neither of us in this brief exchange were more right than the other — after all, it was just a facebook post — but that is to say that we are constantly reinforcing these ideas of gender norms whether we notice it or not. At the end of the day it is just turtles all the way down, but in these types of exchanges, it is best to acknowledge (note my assertive tone) the ways in which we may be unintentionally reifying gender norms to see what is at stake in those moments of identity prescription and description. Even though I have no doubt this commenter meant only the best when she lauded my defiance of norms; her seeing it as a defiance only further reinforces those same gender stereotypes. So, by looking at a quiz like this, not with a mind to disprove it but rather with a mind to see the ways in which it is shaping identity, we can learn a lot about the ways in which certain social actors and groups approach these same issues so to hopefully redirect the conversation to consider how these inform identity and look more to the effects of those particular constructions of gender over others. This entry was posted in Grad Blog, Relevance of Humanities, Religion in Culture and tagged Andie Alexander, Gender, Identity Construction, stereotypes by Andie Alexander. Bookmark the permalink. Very well stated. Andie, I am so very proud of you. Thanks, Mrs. Martin! Very kind.